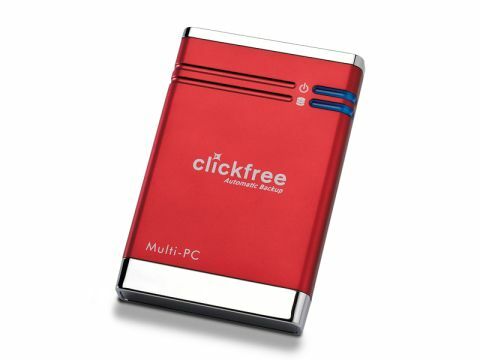 Clickfree's Automatic Backup 250GB is a simple way to back up your digital data files, though it won't clone your entire hard drive or back up applications. Boasting a pocket-sized form factor, this plug-and-play device works on any Mac running Leopard, with no software installation necessary. When you first connect it, the drive's built-in software scans for and backs up more than 400 types of data file, including photos, music files, emails, text documents, movies and more. Subsequent back-ups are incremental. You can decline to back up certain files by unchecking categories such as 'photos' or 'music'. Unfortunately, you can't narrow the back-ups within these categories, eg. backing up JPEGs but not TIFFs. Multiple machine and/or user accounts can be backed up on the same drive, with files kept separate for each user. However, they're not protected in any way. Everyone using the back-up drive has unrestricted access to every file on it, regardless of permissions. This is worth bearing in mind if you need to keep your files private. A very welcome feature is the option to back up external HDDs or flash drives as well as your main hard drive. If you only need to back up one Mac, you might be better off investing in a large-capacity external hard drive and using it with Time Machine. But if you're looking for a simple way to back up your digital data, Clickfree Automatic Backup 250GB is well worth a whirl.